The recent launch of Virtual Debit Card service by easypaisa is an innovation which was more likely to come from commercial banking sector than from a branchless banking player. With more than decade long partnership with payment schemes like Visa and MasterCard, it was a value that could easily be added by the banks. Nonetheless, the masses in Pakistan can now avail it and that too without incurring any incremental cost. What is Virtual Debit Card service ? Virtual Debit Card works exactly in same manner as regular Debit Cards offered by many banks to their customers. However, to avail Virtual Debit Card, customer does not have to visit any bank or retailer. They can create the card themselves through Easypaisa app in less than a minute. Who can avail it ? Any Easypaisa Mobile Account customer who has smart phone can download the Easypaisa app and create his own virtual debit card. No restriction of SIM, handset or operating system. 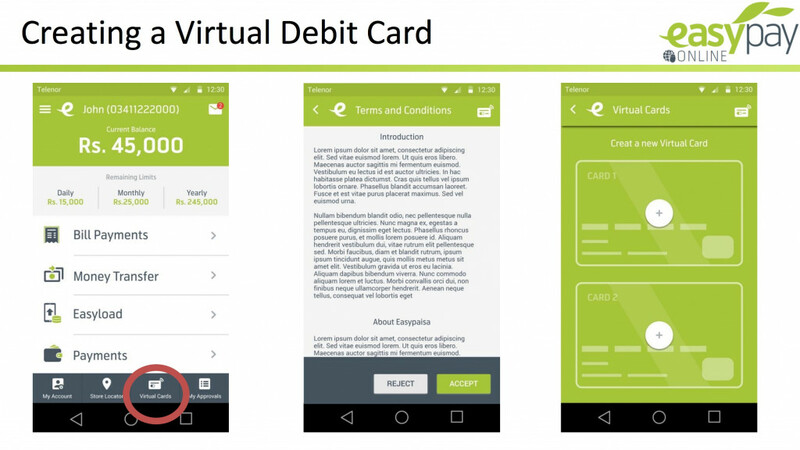 While creating the VDC, app asks users to enter the validity and amount for the card. You can choose both values based on your requirements. For example, if you want to make purchase of Rs.5000 online, you can set it to be value of the debit card. For validity, you have multiple options. In case you are sure about your purchase, you can set the shortest validity. Once card created, it can be deleted and deactivated in case you have changed your mind about the purchase. Furthermore, the money isn’t deducted until the card is used online. other designated debit card terminals. Just be sure that Virtual Debit Card shall not be used for any illegal, improper or unlawful purpose. Higher security over plastic debit cards is the best part of this offering. It’s very much likely for plastic card to get stolen. Someone can capture the information and use later. However, with VDC, possibility of stealing is completely removed. 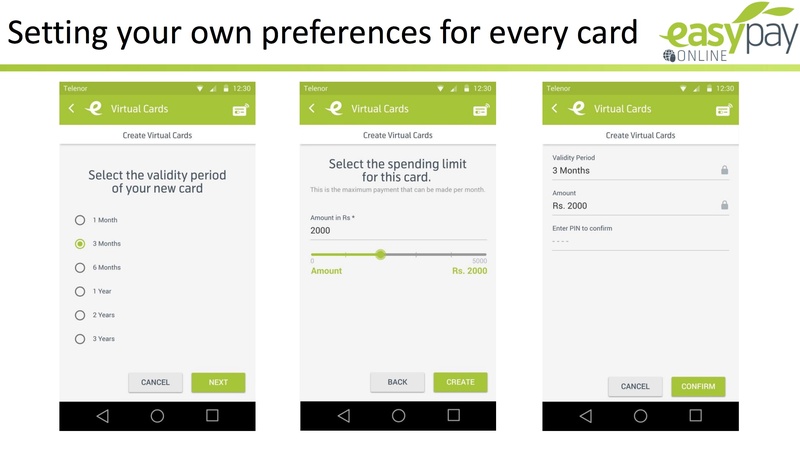 Furthermore, you can be cautious in your spending because you can create cards with limit of your choice. Once used, you can create more cards. Easypaisa claims to be the lowest in pricing in Pakistan as it charges only 2% of the transaction value. This pricing is only applicable on international payments. For payments to local merchants, there are no charges. Isn’t it awesome? Well, possibilities are endless. You can buy online domains, purchase products from e-commerce portals like AliExpress, Amazon, Ebay, etc or even pay at famous domain/hosting companies like GoDaddy. This card works on all online websites that accept MasterCard.